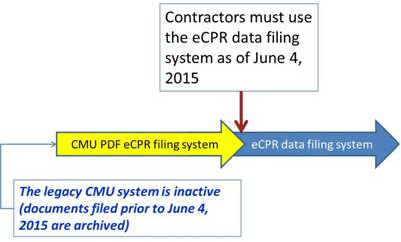 DIR’s upgraded electronic certified payroll reporting (eCPR) system is now in use. Contractors and subcontractors on all public works projects awarded on or after April 1, 2015, must use this system to furnish certified payroll records (CPRs) to the Labor Commissioner. Contractors and subcontractors who have been submitting PDF copies of their CPRs for earlier projects must also begin using the new system. CPRs can be imported automatically using an XML file or uploaded individually onto an online form. The eCPR application supports Internet Explorer 9 and higher, and the latest versions of Chrome, Firefox, and Safari. No additional software is required. Exemptions: Please refer to the list of projects for which contractors must use different payroll reporting methods. Contractors and subcontractors must register with DIR and meet certain requirements before bidding or working on public works in California. Read the SB 854 Fact Sheet for a complete list of requirements. Registration is completed online and requires payment of a non-refundable annual fee of $300. Registration and renewal is on a fiscal year (July 1 to June 30) basis. Make sure you are registered before you bid on Public Works Projects! Eligibility. Employees who work at least 30 days in a year are eligible to receive paid sick leave. Employees can begin using accrued sick leave once they have worked for an employer for 90 days. A few, specific types of employees are not eligible to receive paid sick leave, including certain employees covered by collective bargaining agreements, certain individuals employed by air carriers, and employees of the California In-Home Supportive Services Program. Accrual of sick leave. Employees will accrue one hour of paid sick leave for every 30 hours worked. Paid sick leave must carry over from year to year, but employers can place a cap on accrual of 48 hours (or six days). Use of sick leave. Employers can limit an employee’s use of sick leave to 24 hours (or three days) per year. Employers can also require employees to take sick leave in at least two hour increments, but not more. Lump-sum option. To avoid the administrative hassles of the accrual and carryover requirements, an employer can make three days of paid sick leave available to each employee at the beginning of each year. Reasons for taking sick leave. California’s sick leave law allows employees to take sick leave for their own health condition or the health condition of a family member, including preventative treatment. “Family member” is defined broadly and includes a spouse, domestic partner, parent, child, parent-in-law, grandparent, grandchild, and sibling. Employees may also take sick leave if they are victims of domestic violence, sexual assault, or stalking. No payout on separation. Employers do not need to pay out accrued sick leave when an employee leaves the company. However, if an employee leaves and is rehired within one year, accrued sick leave must be reinstated. Posting requirements. A sick leave poster, available from the California Labor Commissioner, must be displayed at the workplace. Notice and recordkeeping. The amount of available sick leave must be recorded on each paystub (or in some other written form on payday), and employers must keep records of sick leave accrual and use for three years. In an effort to secure a consistent funding source for the enforcement of prevailing wage requirements and to streamline the monitoring enforcement process, the California legislature approved and Governor Brown has signed a contractor registration program through amendments to Division 2, Part 7, Chapter 1 of the Labor Code. This Alert will outline the nuts and bolts of the legislation (known as SB 854) and what public works contractors and awarding bodies need to know to properly register and comply with the new proposed requirements. Click here to read the entire Alert! ABC's Health Care Law Employer Toolkit (login required) is a one-stop shop of resources to help employers navigate their way through the ACA. The toolkit includes reference guides, webinars, PowerPoint presentations, government resources and much more. ABC's Health Care Law Employer Toolkit is updated regularly; visit it today on ABC National's website! California’s prompt payment statutes generally require public entities to release any retention they have withheld from general contractors within sixty days following completion of a public work of improvement. These statutes also require general contractors to pay their subcontractors any retention they have withheld within seven days of receipt of retention proceeds from the project owner. Failure to pay retention proceeds within these time periods results in liability for a penalty in the amount of two percent per month of any improperly withheld funds, including attorneys’ fees and costs. WASHINGTON (AP) — Construction workers in confined spaces like manholes and tanks will come under a new federal rule intended to give them similar protections to workers in manufacturing and other industries. The rule is being issued by the Labor Department's Occupational Safety and Health Administration . Officials say it will prevent about 800 serious injuries and deaths each year. It takes effect Aug. 3, 2015. Workers in confined spaces face risks of exposure to toxic substances, electrocution, asphyxiation and explosions. Under the rule, multiple employers at a work site, such as contractors, will be required to share safety information and continuously monitor hazards. Safety training for workers and frequent assessment of work sites also will be required. Officials say the rule likely would have prevented the deaths of two workers in Ohio last year who were overcome by fumes and asphyxiated while repairing leaks in a manhole. Manholes, crawl spaces, tanks and other confined working spaces aren't meant to be continuously occupied and can be difficult to get out of in an emergency, according to OSHA . "All workers have the right to a safe and healthy workspace," David Michaels , assistant labor secretary for occupational safety and health, told reporters in a conference call Friday. "Workers' lives will be saved and serious injury prevented by this new rule."